If a changing table doesn’t quite fit your storage and baby changing needs, many double dressers can be converted to a changing table with a few additional accessories. 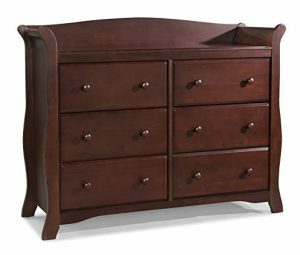 The Angel Changing Table Dresser by South Shore Furniture features a removable changing station and six drawers for convenient storage. 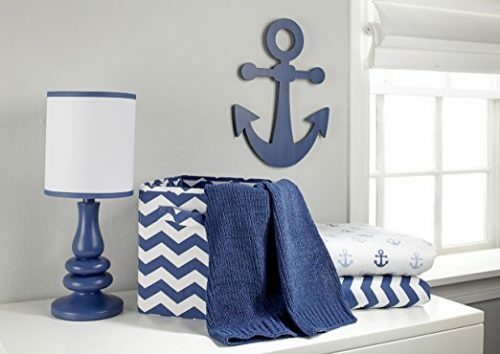 To create the perfect baby changing table dresser, you’ll need a contoured changing pad with safety straps, waterproof pad, changing pad covers, a diaper caddy for portable storage, and furniture straps to prevent the dresser from tipping over. We’ve included a summary of these accessories below for your convenience. 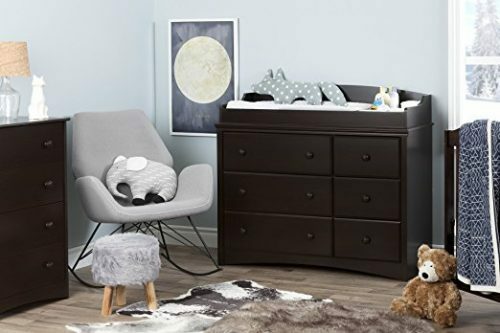 Utilizing a double dresser as a changing table in your nursery will provide ample storage for baby clothes and changing supplies. As baby transitions out of a changing schedule and into potty training, you’ll still have a beautiful set of dresser drawers, which compliment your child’s room. Below we’ve provided a comparison chart of our favorite baby changing table dressers as well as an in-depth look at the accessories you’ll need to create the perfect changing surface for you and your little one! 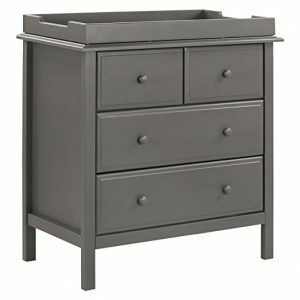 Some baby changing table dresser models are conveniently designed to be a changing table without needing additional construction or installation. 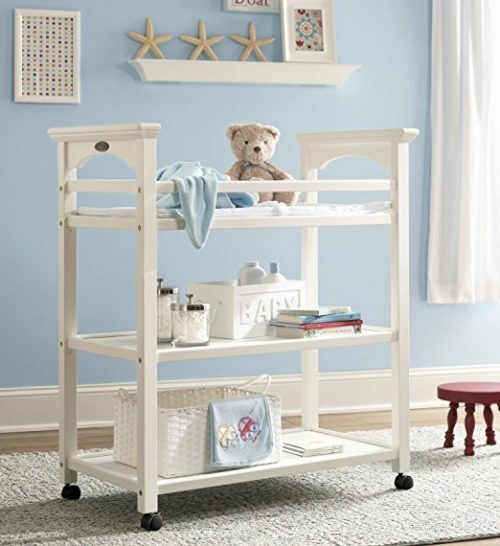 Below we’ll cover two of our favorite baby changing table dressers. We always recommend purchasing furniture wall straps, such as the Safety 1st Furniture Wall Straps 8pk, to prevent injuries from the dresser topping over. Our favorite in this category is the Stork Craft Avalon Universal Dresser. It’s a beautiful nursery dresser with changing table functionality. 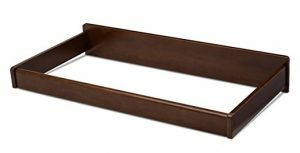 It offers three raised edges and a large changing surface to accommodate a contoured changing pad (sold separately) as well as a diaper caddy. The six drawers are stable in construction and spacious for all of your storage needs. 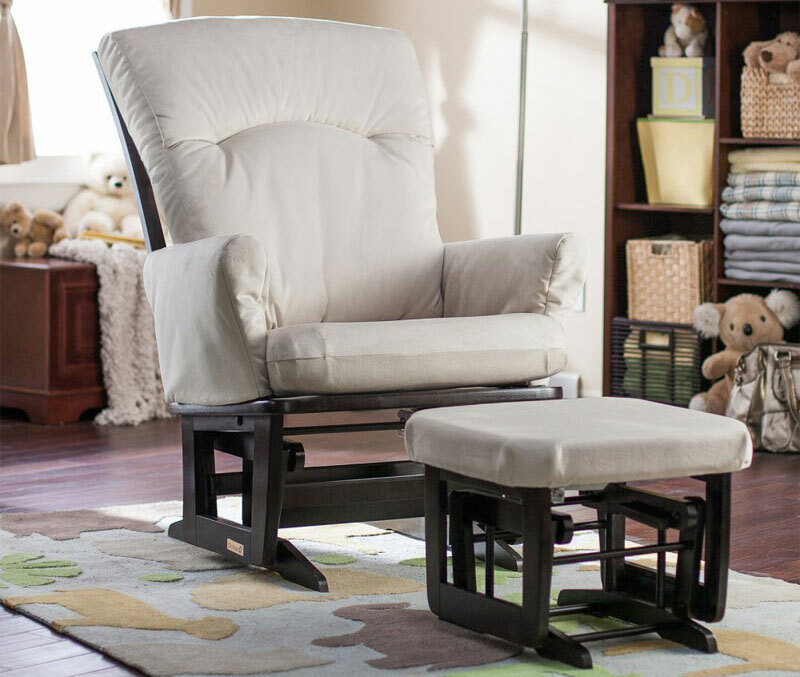 The low dresser height makes it easy for mom or dad to change baby with ease. It is described as universal because it can be matched with any Stork Craft Baby Crib Sets or Nursery Gliders and Ottomans. 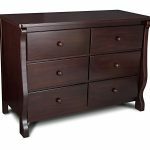 Another beautiful option, which is smaller in size, is the DaVinci Autumn Changing Table Dresser with four drawers. Not only does this baby changing table dresser feature a removable changing station, but it also includes an Anti-Tipping Kit with instructions for installation. Once the changing station is removed, you can continue using the dresser drawers well into your child’s later stages. 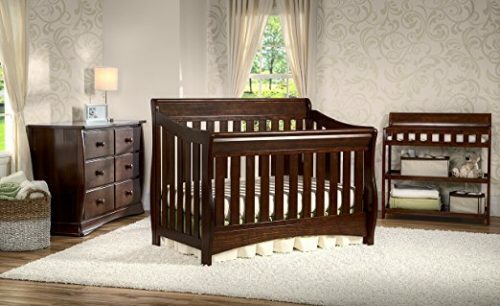 The second option for designing the best baby changing table dresser is to select a double nursery dresser that matches your crib and installing an additional changing table kit. Pictured above is the Universal 6 Drawer Dresser and the matching Changing Kit by Delta Children. Though sold separately, these coordinating pieces make the perfect changing surface for baby. Because the dresser is 48.5″ in length and the changing kit only 36.25″, there is still ample room for a storage solution such as a diaper caddy. Below are the recommended accessories to ensure your baby changing surface is stocked and ready for day to day use! To ensure your baby changing table dresser is fully functional and ready to use, we’ve created a list of the top changing table accessories: changing pads, changing pad covers, waterproof liners, diaper caddies, and furniture wall straps. As noted in previous sections, a contoured baby changing pad is suggested for all dressers being used as a changing surface. 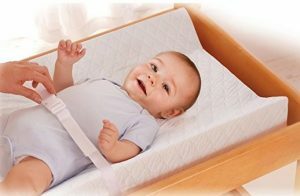 This is because the raised edges and security strap will help prevent baby from rolling over, and potentially off of the changing surface. It is always important to keep one hand on your baby during the changing process to ensure their safety as well. We highly recommend the Summer Infant Changing Pad. It features a non-skid bottom, a furniture strap to secure the pad to the changing surface, a waterproof surface which is essential for leaks during changing, and a safety strap to keep baby safe. Most changing pads will be a standard 32″ in length x 16″ depth. There are four-sided contoured pad options available from Summer Infant as well. 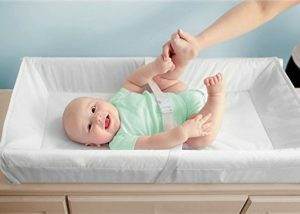 One product that combines a contour changing pad and changing table kit is the Summer Infant Safe Surround Changing Pad. 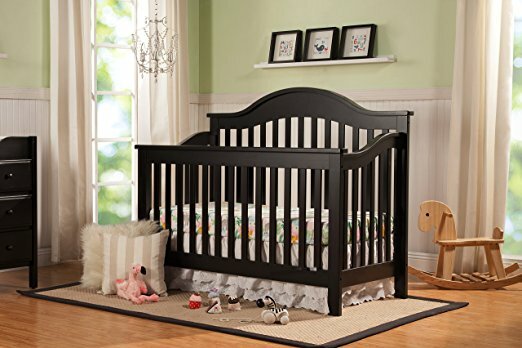 It features extra tall contoured sides, sturdy frame, anti-slip rubber feet, quick-release safety strap, and fits most standard changing pad covers. Measuring at 33″ x 16.3″ x 5.7″, this is an affordable alternative to purchasing a changing table kit and does not require an additional changing pad. Though changing pads are designed with baby’s comfort and safety in mind, the waterproof material may not be the most enjoyable surface for baby’s sensitive skin. The have an elastic bottom to secure the cover in place as well as slits to accommodate the saftey straps. We love the Summer Infant Ultra Plush Changing Pad Covers – 2pk for their wide range of colors and super soft material. We always recommend multiples so one can be in use on the changing pad and the second (or third!) can be in the wash and ready to use after the next blowout. Munchkin Waterproof Liners – Rated 4 out of 5 by parents! These thin waterproof pads are a multi-use accessory that help moms and dads with messy diaper changes. 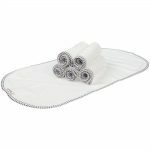 With a PVC-free waterproof backing, these liners will prevent leaks and protect your changing pad cover between washes. These Munchkin Waterproof Changing Pad Liners – 6pk are a great day-to-day solution for any scenario. Their small size makes them great for on-the-go to changing baby after bath time to managing diaper blowouts. Diapers, wipes, creams, lotions, oh my! In order to make changing baby as efficient and fuss-free as possible, it’s important to have a storage solution with all of the diaper necessities within reach. We love the Sarabear Portable Diaper Caddy. With five internal cubbies and multiple colors available, this diaper caddy is both functional and adorable. 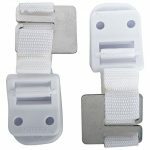 Safety 1st – Furniture Wall Straps – Rated 4.4 / 5 by moms and dads! One of the leading causes of injuries in young children who are able to crawl and climb is from furniture tipping over. These injuries are easily preventable with the use of furniture wall straps. These Safety 1st Furniture Wall Straps – 8pk are a great solution to prevent furniture from tipping in the case of an earthquake or an adventurous toddler climbing on the dresser drawers.